Smart Money magazine recently ran an article entitled “10 Things Divorce Attorneys Won’t Say.” The article provides a great deal of fodder for a blogger, so I’ll be commenting on these “things” from time to time – are these really things which I wouldn’t say? Please get the double negative: This one is correct, I won’t say that – because, fortunately, I have not been sued a lot. In fact, I’ve never been sued at all – and I want to keep it that way! The article does make a good point, although it is not real clear on what it means to “get sued.” If it means malpractice, I don’t know of any statistics which show that family law attorneys have a higher incidence than other lawyers. However, if it means ethical grievances (which really are not lawsuits), the statistics are clear that family law attorneys are second only to criminal law attorneys in the number of grievances. 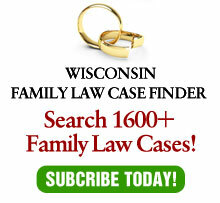 See appendix 8B, for example, of the latest report by the Wisconsin Office of Lawyer Regulation. Note that I said “grievances” – not actual disciplinary actions filed. In fact, to my knowledge, the rate of actual violations by family law attorneys is not higher than any other area of law – only the rate of complaints. Why is this? I refuse to believe that divorce lawyers are less ethical (or more ethical, if that is a correct term. Actually, being “ethical” is a black and white issue, in my opinion). Rather, we commonly deal with clients who going through a very emotional experience. Some deal with these extreme emotions appropriately – which typically includes counseling. Others deal, well, not so healthily. The term of art is “transference” – meaning that some divorcing parties transfer their anger to their attorney. Fortunately, this is not common and most of the clients we serve are highly appreciative of our services. For that small minority, who treat lawyers as part of the problem rather than part of their solution, it’s part of the cost of practicing in this field.